Back in 2004 when I first heard that NE was making a comeback album, my first thought was “why bother?” (and that’s soley based off of them making new music, not their catalogue) But then when I heard “Hot Tonight” I was blown away! This song was bananas! It didn’t sound like some washed up R&B dudes trying to sound young, these dudes sounded right at home on the track. And the beat? The beat was CRAZY! And when I checked to see who produced it, that was the first time I heard of Ryan Leslie. After that, whether it was from the videos he’d post on you tube of him making beats from scratch (which I LOVE) to the hoopla between him, Diddy and Casie, it seemed like I was starting to hear his name on the norm. After his self titled debut album dropped I could now say I was checking for dude because there was a rack of bangers on there but I can’t front, I wasn’t blown away by his sophomore album “Transition.” But when I saw a video of him cooking up the track for “5 Minute Freshen Up” which was gonna be on his new album “Les Is More” I automatically got hype to see what he was gonna on tap next. Then I heard that on this album, dude wasn’t gonna be singing but instead he was gonna be rhyming. Word? Well I guess we’ll see how that goes for money. “Les Is More” sets off with “Glory” which is a banger and gives you a preview of what R Les' rhyme style is gonna be like for the album. Lines like “they had me feeling like Miles Davis, kind of blue” and “eating everyone in the game, pac man” he kinda let's you know he's not exactly the next Kendrick Lamar to step on the scene. “Beautiful Lie”, “Good Girl” and Swiss Francs” are all dope and have that classic “Ryan Leslie sound” to them but I REALLY mess with “Dress You To Undress You” and “Maybach and Diamonds” because they both take a detour from that electo heavy synth “Ryan Leslie sound” I was just talking about and give you a real heavy soul sampled based feel to them. "Ups and Downs", "Ready or Not", "Lovers and Mountains" and "The Black Flag" all bring you right back to the good ole "Ryan Leslie sound" again but they're still dope but the banger of the album is EASILY "Five Minute Freshen Up." Maybe it was watching him make the song from scratch or for the simple fact the track is just flat out BANANAS! Either way, you can't go wrong with "Five Minute Freshen Up." 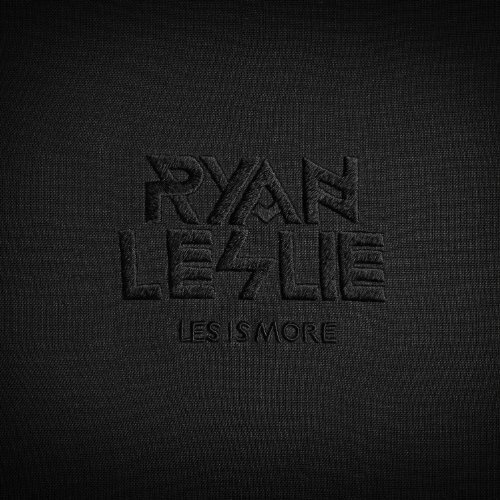 So how does “Les Is More” fit in Ryan’s discography? To me, it fits just fine. I didn’t come into this album expecting to hear illmatic type lyrics and I hope you didn’t either. Dude is a singer who wanted to try his hand at rapping and had the opportunity to make it happen, so he did. But I don’t think Ryan will be putting up 100 stacks to battle the winner of the Meek Millz/Cassidy battle anytime soon though. Is dude the worst MC ever? Naw…not at all but at the same time, I’m sure about 99.9% of money’s fan base would absolutely LOVE for him to go back to the singing side of things. Either way, “Les Is More” is a legit release with dope production and if you can stand Ryan telling you for 50+ minutes how he lives in V.I.P, how many bottles he pops, how much money he has, etc. etc. (well, after writing that, I guess R. Les fits right in with about 80% of MC’s nowadays) then the rhymes don’t hurt either.